Heat oil in soup pot (4-6 litres) over medium heat, add onions, garlic and ginger. Cook gently until softened. Stir in chicken broth, 1 can of the coconut milk, 1-2 tbsp. of the red curry paste (how spicy do you like it? ), lemon grass, carrots, 1 tbsp. fish sauce and cilantro stems. Bring up to almost boiling and add seasoned chicken pieces. Sauté mushrooms gently in a small pot of butter and set aside. 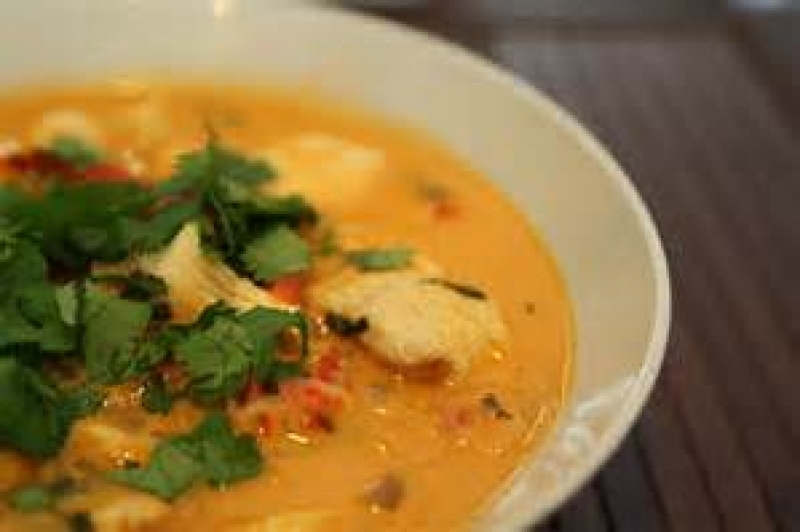 In a small saucepan, heat the 2nd can of coconut milk until hot – not boiling – then whisk in remaining fish sauce. Lime juice and sugar. Add in 1 – 2 more tbsp. of red curry paste. Reduce heat to just below a simmer for approximately 1 hour, until chicken is cooked thoroughly. Remove chicken from soup and allow to cool on cutting board. Discard lemon grass and cilantro stems. Remove soup from heat and skim any surface fat. Shred chicken into bite sized pieces. Add back into the soup along with the coconut milk mixture. Garnish bowls with a pinch of lime zest and roughly chopped cilantro. * Replace chicken with precooked shrimp at the end with the coconut mixture, or as an addition to the chicken for a heartier meal.